This article is about the history of Iran after the 1979 revolution. 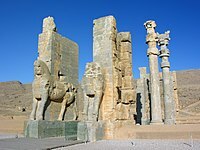 For the history of Iran before 1979, see History of Iran. One of the most dramatic changes in government in Iran's history was seen with the 1979 Iranian Revolution where Shah Mohammad Reza Pahlavi was overthrown and replaced by Ayatollah Ruhollah Khomeini. 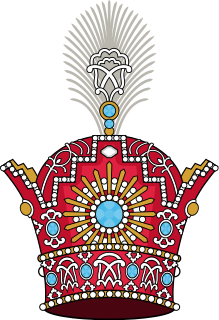 The patriotic monarchy was replaced by an Islamic Republic based on the principle of rule by Islamic jurists, (or " Velayat-e faqih "), where clerics serve as head of state and in many powerful governmental roles. A pro-Western, pro-American foreign policy was exchanged for one of "neither east nor west", said to rest on the three "pillars" of mandatory veil ( hijab ) for women, and opposition to the United States and Israel. A rapidly modernizing, capitalist economy   was replaced by a populist and Islamic economy and culture. The Iranian Revolution was a series of events that involved the overthrow of the monarch of Iran, Mohammad Reza Shah Pahlavi, and the replacement of his government with an Islamic republic under the Grand Ayatollah Ruhollah Khomeini, a leader of one of the factions in the revolt. The movement against the United States-backed monarchy was supported by various leftist and Islamist organizations and student movements. The leader of the revolution and founder of the Islamic Republic, Ayatollah Ruhollah Khomeini, was Iran's supreme leader until his death in 1989. He was followed by Ali Khamenei. During the era of the Islamic Republic, Iran has grown from 39 million (1980) to 81.16 million (2017) people. Some things remain much as they were under the monarchy. Iran has retained its status as a major regional power—it is far larger than any of its gulf neighbors, and possesses large reserves of gas and oil. Its national cohesion brought by a long history as a nation, strong central state government and its oil export revenues have brought it "respectable" levels of income, literacy, college enrollment, infant mortality, and infrastructure. Modern trends found under the monarchy, such as urbanization, growing enrollment in higher education  and literacy, continued. The Islamic Republic of Iran is an Islamic theocracy headed by a Supreme Leader. Its constitution was approved in 1979 and amended in 1989. Jaafari (Usuli) school of thought is the official religion. It has an elected president and elected governmental bodies at the national, provincial and local levels for which all males and females from the age of 18 on up may vote, which are supervised by theocratic bodies, particularly the Council of Guardians which had veto power over who can run for parliament (or Islamic Consultative Assembly) and whether its bills can become law. Nonetheless the elected organs have more power than equivalent ones in the Shah's government. Usulis are the majority Twelver Shi'a Muslim group. They differ from their now much smaller rival Akhbari group in favoring the use of ijtihad in the creation of new rules of fiqh; in assessing hadith to exclude traditions they believe unreliable; and in considering it obligatory to obey a mujtahid when seeking to determine Islamically correct behavior. Following the 1979 revolution in Iran, the Islamic revolutionary regime of Ayatollah Khomeini dramatically reversed the pro-Western foreign policy of the regime it overthrew. Since then, Iran has oscillated between the two opposing tendencies of revolutionary ardour (promoting the Islamic revolution and struggling against non-Muslim tendencies abroad) and moves towards pragmatism (economic development and normalization of foreign relations). Khomeini's 1989 fatwa calling for the killing of British citizen Salman Rushdie for his allegedly blasphemous book, The Satanic Verses, demonstrated the willingness of the Islamic revolutionaries to sacrifice trade and other ties with western countries to threaten an individual citizen of a foreign country living thousands of miles away. On the other hand, Khomeini's death in 1989 led more pragmatic policies, with Presidents Hashemi Rafsanjani and Mohammad Khatami leading the charge for more stable relations with the west as well as its surrounding, non-Revolutionary-Islamic neighbors—i.e., Saudi Arabia. Following the 2005 election of President Mahmoud Ahmedinejad, Iran has returned to more a more hardline stance, frequently antagonizing the west and its neighbors while battling for control over the region. Sir Ahmed Salman Rushdie is a British Indian novelist and essayist. His second novel, Midnight's Children (1981), won the Booker Prize in 1981 and was deemed to be "the best novel of all winners" on two separate occasions, marking the 25th and the 40th anniversary of the prize. Much of his fiction is set on the Indian subcontinent. He combines magical realism with historical fiction; his work is concerned with the many connections, disruptions, and migrations between Eastern and Western civilizations. 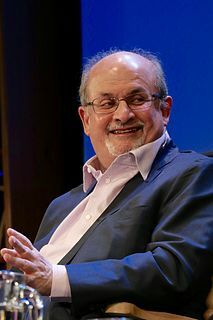 The Satanic Verses controversy, also known as the Rushdie Affair, was the heated and frequently violent reaction of Muslims to the publication of Salman Rushdie's novel The Satanic Verses, which was first published in the United Kingdom in 1988 and inspired in part by the life of Muhammad. 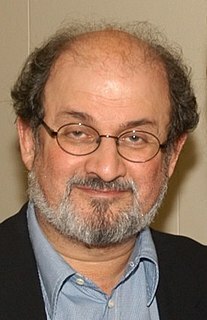 Many Muslims accused Rushdie of blasphemy or unbelief and in 1989 the Ayatollah Ruhollah Khomeini of Iran issued a fatwa ordering Muslims to kill Rushdie. Numerous killings, attempted killings, and bombings resulted from violent Muslims over the novel. SeyyedMohammad Khatami served as the fifth President of Iran from 3 August 1997 to 3 August 2005. He also served as Iran's Minister of Culture from 1982 to 1992. He was a critic of former President Mahmoud Ahmadinejad's government. In the immediate aftermath of the revolution, the Islamic Republic went to war against Saddam Hussein's Iraq after the latter launched a military offensive in the 1980s. With most foreign aid going to Iraq, Iran was forced to accept a ceasefire by 1988. Tensions with Iraq remained long after the war; it was not until the death of Saddam himself that Iran and Iraq have started improving their relations. The Iran–Iraq War was an armed conflict between Iran and Iraq, beginning on 22 September 1980, when Iraq invaded Iran, and ending on 20 August 1988, when Iran accepted the UN-brokered ceasefire. 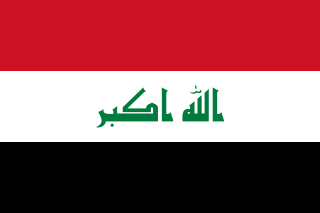 Iraq wanted to replace Iran as the dominant Persian Gulf state, and was worried that the 1979 Iranian Revolution would lead Iraq's Shi'ite majority to rebel against the Ba'athist government. The war also followed a long history of border disputes, and Iraq planned to annex the oil-rich Khuzestan Province and the east bank of the Arvand Rud. Net Iranian migration (1979–2008). A positive value represents more people entering Iran than leaving the country. A 2002 study leaked from Iran's Interior Ministry, reported nearly 90% of respondents dissatisfied with the present government according to Amuzegar. Of this total, 28% wanted "fundamental" changes, 66% "gradual reforms." 10% expressed satisfaction with the status quo. Sahabi family (Ezzatollah Sahabi, Yadollah and Haleh Sahabi), active members of National party were imprisoned and Haleh was killed for their peaceful activism. While the revolution brought about some re-Islamisation of Iran, particularly in terms of personal appearance—beards, hijab—it has not prompted a reversal of some modernizing trends or a return to traditional patterns of family life, (such as polygamy and the extended family with numerous children). The funeral of Grand Ayatollah Hosein-Ali Montazeri who challenged the regime for several decades. For religious minorities, life has been mixed under the Islamic Republic. Khomeini also called for unity between Sunni and Shi'a Muslims (Sunni Muslims are the largest religious minority in Iran). Pre-revolutionary statements by Khomeini were antagonistic towards Jews, but shortly after his return from exile in 1979, he issued a fatwa ordering that Jews and other minorities (except Baha'is) be treated well. Non-Muslim religious minorities do not have equal rights in the Islamic Republic (For example, senior government posts are reserved for Muslims and Jewish, Christian and Zoroastrian schools must be run by Muslim principals  ) but four of the 270 seats in parliament are reserved for three non-Islamic minority religions. The 6.6 Mw  Bam earthquake shook southeastern Iran with a maximum Mercalli intensity of IX (Violent), leaving more than 26,000 dead and 30,000 injured. The 7.4 Mw  Manjil–Rudbar earthquake struck northern Iran with a maximum Mercalli intensity of X (Extreme), killing 35,000–50,000, and injuring 60,000–105,000. Iran's scientific progress is subject to many problems including funding, international sanctions, and management. However, in some areas such as medicine, surgery, pharmacology, stem cell research and theoretical physics (e.g. string theory),  Iranian scientists have found international reputation since the Iranian revolution. Nuclear technology and stem cell research were the two fields that have enjoyed special support from the central government and Iranian leadership since the revolution. Ayatollah Khomeini was the ruler of (or at least dominant figure in) Iran for a decade, from the founding of the Islamic Republic in April 1979 until his death in mid-1989. During that time the revolution was being consolidated as a theocratic republic under Khomeini, and Iran was fighting a costly and bloody war with Iraq. Instability in Iran did not end with the creation of the Islamic Republic and remained high for a few years. The country's economy and apparatus of government had collapsed. Military and security forces were in disarray. But by 1982  (or 1983)  Khomeini and his supporters had crushed the rival factions and consolidated power. The first draft of the constitution for the Islamic Republic contained a conventional president and parliament but its only theocratic element was a Guardian Council to veto unIslamic legislation. However, in the summer of 1979 an Assembly of Experts for Constitution, dominated by Khomeini supporters, was elected. Their new draft gave the guardians much more power and added a powerful post of guardian jurist ruler intended for Khomeini. The new constitution was opposed by non-theocratic groups, both secular and Islamic, and set for approval by referendum in December 1979. US hostages were released after 444 days of detention in Tehran. In succession the National Democratic Front was banned in August 1979, the provisional government was disempowered in November, the Muslim People's Republican Party banned in January 1980, the People's Mujahedin of Iran guerrillas came under attack in February 1980, a purge of universities was begun in March 1980, and leftist President Abolhassan Banisadr was impeached in June 1981. The ouster of President Banisadr did not put an immediate end to the opposition but moved it to terror. Hundreds of PMOI supporters and members were killed from 1979 to 1981, and some 3,000 were arrested,  but unlike other opposition is driven underground by the regime, the PMOI was able to retaliate. 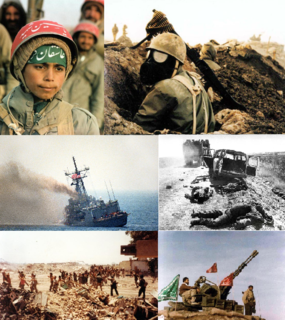 The eight-year-long Iran–Iraq War (September 1980 – August 1988) was the most important international event for the first decade of the Islamic Republic and possibly for its history so far. It helped to strengthen the revolution although it cost Iran much in lives and treasure. Shortly after the success of the revolution, revolutionary leader Ruhollah Khomeini began calling for Islamic revolutions across the Muslim world, including Iran's Arab neighbor Iraq,  the one large state besides Iran in the Gulf with a Shia Muslim majority population. The leadership in Tehran believed that they would launch a massive Shiite uprising across the Middle East and after Iraq's defeat, march on Israel and destroy it. The war began with Iraq's invasion of Iran, in an attempt by Iraq's dictator Saddam Hussein to take advantage of the perceived post-revolutionary military weakness in Iran and the Revolution's unpopularity with Western governments. Much of the top leadership of Iran's once-strong Iranian military had been executed. Saddam sought to expand Iraq's access to the Persian Gulf and the oil reserves in Khuzestan (which also only has a substantial Arab population), and to undermine Iranian Islamic revolutionary attempts to incite the Shi'a majority of his country. Iranians also believe Saddam invaded with the encouragement of the United States, Saudi Arabia and other countries. Iraq invaded and overran Kuwait on August 2, 1990, causing a multinational coalition of UN forces to be assembled in response. Although Iran criticized the invasion and supported sanctions against its neighbor, it refused any active participation in the war, not surprising given the country's anti-Western attitudes and state of exhaustion from the recent conflict with its neighbor. As a result of the war and its aftermath, more than one million Kurds crossed the Iraqi border into Iran as refugees. Between March 2001 and April 2003, the TSE index (Topix) bucked the trend by going up nearly 80%. Khatami based his campaign on a reform program promising a more democratic and tolerant society, promotion of civil society, the rule of law and improvement of social rights. 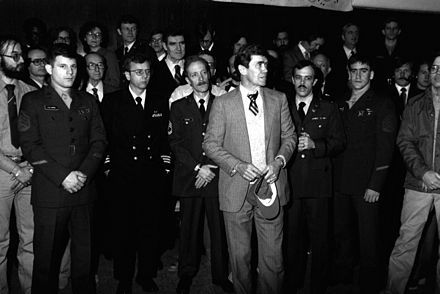 This included city council elections, adherence to Iran's constitution, freedom to criticize high ranking authorities – including the supreme leader, permission to operate newspapers of a wide range of political views, reopening the embassies of all European countries, reorganizing the Ministry of Intelligence of Iran after the Iran's Chain Murders of Intellectuals, initiating a dialogue between people of different faith inside and outside Iran, also called "Dialogue Among Civilizations." Iran's large youth demographic (by 1995, about half of the country's 60.5 million people had not been born after the Islamic Revolution) is one of Khatami's bases of support. After taking office, Khatami faced fierce opposition from his powerful opponents within the unelected institutions of the state which he had no legal power over, and this led to repeated clashes between his government and these institutions (including the Guardian Council, the state radio, and television, the police, the armed forces, the judiciary, the prisons, etc.). In July 1999 conservatives closed the reformist newspaper, Salam, and attacked a Tehran University student dormitory after students protested the closing. 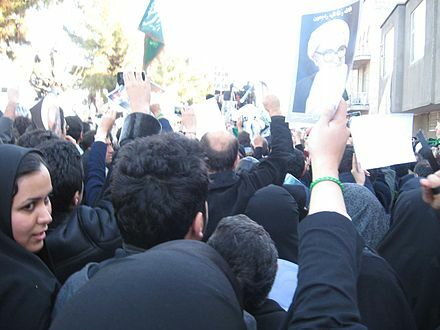 Prodemocracy student demonstrations erupted at Tehran University and other urban campuses. These were followed by a wave of counter-demonstrations by conservative factions. Reformers won a substantial victory in Feb. 2000, parliamentary elections, capturing about two-thirds of the seats, but conservative elements in the government forced the closure of the reformist press. Attempts by parliament to repeal restrictive press laws were forbidden by Supreme Leader Ali Khamenei. Despite these conditions, President Khatami was overwhelming re-elected in June 2001. Tensions between reformers in parliament and conservatives in the judiciary and the Guardian Council, over both social and economic changes, increased after Khatami's reelection. Khatami worked to improve relations with other countries visiting many other countries and holding a dialogue between civilizations and encouraged foreigners to invest in Iran. He announced Iran would accept a two-state solution for Palestine if Palestinians agreed to one, relaxed restrictions on the Bahais, and assured Britain Iran would not implement the fatwa against Salman Rushdie. Several European Union countries began renewing economic ties with Iran in the late 1990s, and trade and investment increased. In 1998, Britain re-established diplomatic relations with Iran, broken since the 1979 revolution. The United States loosened its economic embargo, but it continued to block more normalized relations, arguing that the country had been implicated in international terrorism and was developing a nuclear weapons capacity. In his State of the Union Address, United States President George W. Bush labeled Iran, along with Iraq and North Korea, as an "Axis of evil." Tensions with the United States increased after the Anglo-American invasion of Iraq in March 2003, as U.S. officials increasingly denounced Iran for pursuing the alleged development of nuclear weapons. Mahmoud Ahmadinejad was elected to the presidency twice, in 2005 and 2009. Ahmadinejad ran for office as a conservative populist pledging to fight corruption, defend the interests of the poor, and strengthen Iran's national security. In 2005 he defeated former president Rafsanjani by a wide margin in the runoff, his victory credited to the popularity of his economic promises and a very low reformist voter turnout compared to the 1997 and 2001 elections. This victory gave conservatives control of all branches of Iran's government. Although functions such as the appointment of the commanders of the armed forces and the members of national security councils are handled by the Supreme Leader and not by Iran's president, Ahmadinejad gained considerable international attention for his foreign policy. Under Ahmadinejad, Iran's strong ties with the Republic of Syria and Hezbollah of Lebanon continued, and new relationships with predominantly Shia neighbor Iraq and fellow opponent of U.S. foreign policy Hugo Chavez of Venezuela were developed. After, in August 2005, Iran resumed converting raw uranium into gas, a necessary step for enrichment, the IAEA passed a resolution that accused Iran of failing to comply with the Nuclear Nonproliferation Treaty and called for the agency to report Iran to the UN Security Council. The timetable for the reporting, however, was left undetermined. Iran's stated position is that it is in full compliance with the Nuclear Nonproliferation Treaty, that it has allowed the IAEA inspections beyond what is required, and that it has no ambitions to build atomic weapons. In February 2004, elections, conservatives won control of parliament, securing some two-thirds of the seats. Many Iranians, however, were unhappy with the failure of the current parliament to achieve any significant reforms or diminish the influence of the hardliners. In mid-2004 Iran began resuming the processing of nuclear fuel as part of its plan to achieve self-sufficiency in civilian nuclear power production, stating that the negotiations with European Union nations had failed to bring access to the advanced nuclear technology that was promised. The action was denounced by the United States as one which would give Iran the capability to develop nuclear weapons. The IAEA said that there was no evidence that Iran was seeking to develop such arms. However, the IAEA also called for Iran to abandon its plans to produce enriched uranium. In November 2004, Iran agreed to suspend uranium enrichment but subsequently indicated that it would not be held to the suspension if the negotiations the EU nations failed. Several controversial proposals by President Ahmadinejad and conservatives have not come to fruition. Plans to encourage larger families,  to encourage polygamy by permitting it despite the opposition of a husband's first wife; and to put a tax on Mahriyeh—a stipulated sum that a groom agrees to give or owe to his bride which is seen by many women "as a financial safety net in the event a husband leaves the marriage and is not forced to pay alimony"   —have not gone anywhere. Iranians are divided on the government's performance. Worry over sanctions and isolation. Want to focus on domestic affairs. Favor closer ties to the West. Rising tensions sparked hostility toward the US, Europe, and U.N. Favor nuclear arms and do not want to back deals to halt enrichment. Independent polls do not contradict official turnout of 2009 election, which gave around 60% of the vote to Ahmadinejad. The President of Iran is the head of government of the Islamic Republic of Iran. The President is the highest ranking official of Iran. The President carries out the decrees, and answers to the Supreme Leader of Iran, who functions as the country's head of state. Unlike the executive in other countries, the President of Iran does not have full control over anything, as these are ultimately under the control of the Supreme Leader. Chapter IX of the Constitution of the Islamic Republic of Iran sets forth the qualifications for presidential candidates. The procedures for presidential election and all other elections in Iran are outlined by the Supreme Leader. The President functions as the executive of the decrees and wishes of the Supreme Leader. These include signing treaties and other agreements with foreign countries and international organizations, with Supreme Leader's approval; administering national planning, budget, and state employment affairs, as decreed by the Supreme Leader. The President also appoints the ministers, subject to the approval of Parliament, and the Supreme Leader who can dismiss or reinstate any of the ministers at any time, regardless of the president or parliament's decision. The Supreme Leader Ali Khamenei directly chooses the ministries of Defense, Intelligence and Foreign Affairs, as well as certain other ministries, such as the Science Ministry. Iran’s regional policy is directly controlled by the office of the Supreme Leader with the Ministry of Foreign Affairs’ task limited to protocol and ceremonial occasions. All of Iran’s ambassadors to Arab countries, for example, are chosen by the Quds Corps, which directly reports to the Supreme Leader. Seyyed Mohammad Hosseini Beheshti was an Iranian jurist, philosopher, cleric and politician who was known as the second person in the political hierarchy of Iran after the revolution. Dr. Beheshti is considered to have been the primary architect of Iran's post-revolution constitution, as well as the administrative structure of the Islamic Republic. Beheshti was assassinated along with more than 70 members of the Islamic Republic Party on 28 June 1981. Akbar Hashemi Rafsanjani was an influential Iranian politician, writer and one of the founding fathers of the Islamic Republic who was the fourth President of Iran from 3 August 1989 until 3 August 1997. He was the head of the Assembly of Experts from 2007 until 2011, when he decided not to nominate himself for the post. He was also the chairman of the Expediency Discernment Council. Hussein-Ali Montazeri was an Iranian Shia Islamic theologian, Islamic democracy advocate, writer and human rights activist. He was one of the leaders of the Iranian Revolution in 1979. He was once the designated successor to the revolution's Supreme Leader Ayatollah Khomeini, with whom he had a falling-out in 1989 over government policies that Montazeri claimed infringed on people's freedom and denied them their rights. Montazeri spent his later years in Qom, and remained politically influential in Iran, especially to the reformist movement. He was widely known as the most knowledgeable senior Islamic scholar in Iran and a Grand Marja of Shia Islam. Mir-Hossein Mousavi Khameneh is an Iranian reformist politician, artist and architect who served as the seventy-ninth and last Prime Minister of Iran from 1981 to 1989. He was a reformist candidate for the 2009 presidential election and eventually the leader of the opposition in the post-election unrest. Mousavi served as the president of the Iranian Academy of Arts until 2009, when Conservative authorities removed him. Sayyid Mahmoud Hashemi Shahroudi was an Iranian Twelver Shia cleric and conservative politician who was the Chairman of the Expediency Discernment Council from 14 August 2017 until his death on 24 December 2018. He was previously the Chief Justice of Iran from 1999 to 2009. The Alliance of Builders or Developers of Islamic Iran, usually shortened to Abadgaran, was an Iranian conservative political federation of parties and organizations. Described as "Iran's neocons", main groups within the alliance were Front of Followers of the Line of the Imam and the Leader members and Society of Devotees of the Islamic Revolution. The Islamic Republican Party formed in mid-1979 to assist the Iranian Revolution and Ayatollah Khomeini establish theocracy in Iran. It was disbanded in May 1987 due to internal conflicts. The Cultural Revolution (1980–1983) was a period following the Iranian Revolution, when the academia of Iran was purged of Western and non-Islamic influences to bring it in line with the revolutionary and Political Islam. The official name used by the Islamic Republic is "Cultural Revolution". The Guardianship of the Islamic Jurist, also called the Governance of the Jurist, is a post-Occultation theory in Shia Islam which holds that Islam gives a faqīh custodianship over people. Ulama supporting the theory disagree over how encompassing custodianship should be. One interpretation – Limited Guardianship of the Islamic Jurist – holds that guardianship should be limited to non-litigious matters including religious endowments (Waqf) judicial matters and the property for which no specific person is responsible. Another – Absolute Guardianship of the Islamic Jurist – maintains that Guardianship should include all issues for which ruler in the absence of Imams have responsibility, including governance of the country. The idea of guardianship as rule was advanced by the Ayatollah Ruhollah Khomeini in a series of lectures in 1970 and now forms the basis of the Constitution of the Islamic Republic of Iran. The constitution of Iran calls for a faqih, or Vali-ye faqih, to serve as the Supreme Leader of the government. In the context of Iran, Guardianship of the Islamic Jurist is often referred to as "rule by the jurisprudent", or "rule of the Islamic jurist". The Society of Seminary Teachers of Qom was founded in 1961 by the leading Muslim clerics of Qom, established by the students of Ayatollah Khomeini after his exile to Iraq in order to organize political activities of Khomeini's followers and promote his revolutionary interpretation of Islam such as the idea of Islamic government. Since the 1979 revolution, it has largely become the body to keep the regime's registrar of who counts as a grand ayatollah, an Ayatollah and a Hojjat ul Islam. It has a head who is appointed by the Supreme Leader of the Islamic Republic. It currently heads the Supreme Council of Qom Hawzas, and proposes judges to the judiciary system. The body gained international prominence when it announced in 1981 that Ayatollah Shariatmadati was no longer a source of emulation (marja'). It has demoted a number of clerics over the last three decades. A recent case was that of Ayatollah Yousef Saanei who for his solidarity with the green movement was demoted from marja' to hojatoleslam. The Society also include Ayatollah Sistani on its list. Khomeinism is the founding ideology of the Islamic Republic of Iran. Impact of the religious and political ideas of the leader of the 1979 Iranian Revolution, Grand Ayatollah Ruhollah Khomeini include replacing Iran's millennia-old monarchy with theocracy. Khomeini declared Islamic jurists the true holders of not only religious authority but political authority, who must be obeyed as "an expression of obedience to God", and whose rule has "precedence over all secondary ordinances [in Islam] such as prayer, fasting, and pilgrimage." On 28 June 1981, a powerful bomb went off at the headquarters of the Iran Islamic Republic Party (IRP) in Tehran, while a meeting of party leaders was in progress. Seventy-three leading officials of the Islamic Republic were killed, including Chief Justice Ayatollah Mohammad Beheshti. The Islamic Republic of Iran first blamed SAVAK and the Iraqi regime. Two days later, Ruhollah Khomeini accused the People's Mujahedin of Iran. A few years later, a Kermanshah tribunal executed four "Iraqi agents" for the incident. Another tribunal in Tehran executed Mehdi Tafari for the same incident. In 1985, the head of military intelligence informed the press that this had been the work of royalist army officers. Iran's security forces blamed the United States and "internal mercenaries". Esfandiar Rahim Mashaei is an Iranian politician and former intelligence officer. As a senior Cabinet member in the administration of President Mahmoud Ahmadinejad, he served as Chief of Staff from 2009 to 2013, and as the First Vice President of Iran for one week in 2009 until his resignation was ordered by Supreme Leader Ayatollah Ali Khamenei. Prime ministership of Mir-Hossein Mousavi were the third and fourth government of Iran after the Iranian Revolution. At that time, Ali Khamenei was the president. Presidency of Akbar Hashemi Rafsanjani was the 5th and 6th government of Iran after Iranian Revolution. At that time, Akbar Hashemi Rafsanjani was the president. The Supreme Council of the Cultural Revolution is a conservative-dominated body based in Qom, was set up at the time of Ayatollah Khomeini. Its decisions can only be overruled by Iran's Supreme Leader. Most of its members were appointed by Ali Khamenei, Khomeini's successor. The Supreme Leader of Iran, also referred to as Supreme Leader of the Islamic Revolution, but officially called the Supreme Leadership Authority, is the head of state as well as the ultimate political and religious authority of the Islamic Republic of Iran. The armed forces, judiciary, state television, and other key government organizations are subject to the Supreme Leader. The current longtime officeholder, Ali Khamenei, has been issuing decrees and making the final decisions on economy, environment, foreign policy, education, national planning, and everything else in Iran. Khamenei also makes the final decisions on the amount of transparency in elections, and has dismissed and reinstated presidential cabinet appointees. The Supreme Leader directly chooses the ministers of Defense, Intelligence and Foreign Affairs, as well as certain other ministers, such as the Science Minister. Iran's regional policy is directly controlled by the office of the Supreme Leader with the Ministry of Foreign Affairs' task limited to protocol and ceremonial occasions. All of Iran's ambassadors to Arab countries, for example, are chosen by the Quds Corps, which directly report to the Supreme Leader. ↑ One study estimates that conflict in the Middle East has cost the Iranian population a substantial fraction of per capita income in opportunity cost of foregone economic growth. A report by the Asian think tank Strategic Foresight Group estimates the opportunity cost of conflict (i.e. not just the cost of arms and destruction but lack of economic growth that peaceful coexistence would have made possible) in the Middle East from 1991–2010 at a $12 trillion. Iran’s share of the opportunity cost came to over $2.1 trillion. In other words had there been peace since 1991, the average Iranian citizen would have an estimated income of $7700 rather the $4100 that he or she will earn in 2010. ↑ Iran Archived 2006-06-16 at the Wayback Machine , the UNESCO EFA 2000 Assessment: Country Reports. ↑ Adult education offers new opportunities and options to Iranian women, UNGEI. ↑ Adult education offers new opportunities and options to Iranian women, UNFPA. ↑ IRNA: Crude price pegged at dlrs 39.6 a barrel under next year's budget. Retrieved December 5, 2008. ↑ MSN Encarta: Iran–Iraq War Retrieved January 29, 2009. Archived 2009-10-31. ↑ Keddie, Modern Iran, (2003), p.271. 1 2 "Iran: Bribery and Kickbacks Persists Despite Anti-Corruption Drive." Global Information Network, July 15, 2004 p. 1. 1 2 "Still failing, still defiant", Economist, December 9, 2004. ↑ IMF (March 2010). "Iran: 5. Report for Selected Countries and Subjects". Washington, D.C.: International Monetary Fund. ↑ Council Of Guardians Rules 9 Years Is Girls' Marriage Age . Retrieved 7-26-2007. ↑ see Marie Ladier-Fouladi, Population et politique en Iran, Paris: Institut national d'études démographiques, 2003. ↑ Marie Ladies-Fouladi, cited in Azadeh Kian-Thiebaut, Femmes iraniennes entre Islam, Etat, famille, Paris: Maisonneuve et Larose, 2000, pp.128, 149. ↑ "The Culture of Imperialism"; "Iranian Women and the Effects of a Possible War"
↑ ‘Political Inclinations of the Youth and Students,’ Asr-e Ma, n.13, 19 April 1995 in Brumberg, Reinventing Khomeini (2001), pp. 189–90. ↑ Iran Human Rights Documentation Center (2007). "A Faith Denied: The Persecution of the Baha'is of Iran" (PDF). Iran Human Rights Documentation Center. Archived from the original (PDF) on 2007-11-27. Retrieved 2007-10-06. ↑ Ruhollah Khomeini Archived 2007-10-08 at the Wayback Machine , Encyclopædia Britannica. ↑ Fundamentalist Power, Martin Kramer. ↑ Moin, Khomeini, 2000, p. 217. ↑ Manou & Associates Inc. "Iranian Government Constitution, English Text". Iranonline.com. Archived from the original on 2010-11-23. Retrieved 2010-08-21. ↑ Bakhash, Shaul, The Reign of the Ayatollahs, p. 73. ↑ "The address you were looking for doesn't exist". Tkb.org. Retrieved 2010-08-21. ↑ Moin, Khomeini, (2000), p. 241–2. ↑ IRI government estimate is 200,000 Iranian troops and civilians killed. ↑ Iran: imprisonment, torture, and execution of political opponents / Amnesty International. Amnesty International, 1992. ↑ June 04, 2008. Iran President Ahmadinejad condemns Israel, U.S.
↑ news/AFP/article/ALeqM5j8GPoWmrf2qerPWQNHb8Z9eGjT3Q "Iran official says 36 killed in post-vote unrest" Check |url= value (help). AFP. 10 September 2009. 1 2 (AFP) – Sep 3, 2009 (2009-09-03). "AFP: Iran opposition says 72 killed in vote protests". Google.com. Retrieved 2010-09-11. ↑ Saeed Kamali Dehghan (2011-05-05). "Ahmadinejad allies charged with sorcery". London: Guardian. Retrieved 2011-06-18. ↑ "President says his letter to President Bush was invitation to Islam." Archived 2006-09-02 at the Wayback Machine Islamic Republic News Agency. Retrieved 29-10-2006. ↑ "Ahmadinejad's letter to Americans." CNN. Retrieved 26-01-2008. ↑ "President misquoted over gays in Iran: aide | International". Reuters. 2007-10-10. Retrieved 2009-06-21. ↑ "Iran mulling dynamic, progressive economy, prez". Mathaba.net. 2008-10-31. Archived from the original on 2009-10-15. Retrieved 2009-06-21. ↑ Iran leader defends Israel remark BBC News, 28 October 2005, "Iran's president has defended his widely criticised call for Israel to be 'wiped off the map'". ↑ Bronner, Ethan (June 11, 2006). "Just How Far Did They Go, Those Words Against Israel?". New York Times. Retrieved 2006-06-11. ↑ "Annan 'dismayed' by Iran remarks". BBC News. 28 October 2005. Retrieved 2006-10-29. ↑ "UN raps Iran's anti-Israel rant". BBC News. 28 October 2005. Retrieved 2006-10-29. ↑ "1385-03-22 ah". Iranian Presidency. Archived from the original on 2007-10-12. ↑ "1385-03-12 ah". Iranian Presidency. Archived from the original on 2007-10-12. ↑ "Ali Akbar Velayati, Advisor". Iran Press Service. Archived from the original on 2011-09-27. ↑ "Ahmadinejad: Qods Day to liberate Palestine, solve entire world problems". Islamic Republic News Agency. 2 August 2012. Archived from the original on 4 August 2012. Retrieved 2 August 2012. ↑ "Iran’s Nuclear Program: Tehran’s Compliance with International Obligations" Congressional Research Service, 4 April 2017. ↑ Greenwald, Glenn (2012-01-11). "More murder of Iranian scientists: still Terrorism?". Salon. Retrieved 2012-01-11. ↑ "News Analysis: Firing Tightens Iranian President's Economic Circle". Payvand.com. 2006-11-22. Retrieved 2010-08-21. ↑ "Iran may Probe into Officials' Assets". Payvand.com. 2006-11-22. Retrieved 2010-08-21. ↑ "Iran: Fate of $66 Billion in Oil Revenues Unknown". Payvand.com. 2006-11-22. Retrieved 2010-08-21. ↑ "Iran's massive oil revenue discrepancies". UPI.com. 2009-09-23. Retrieved 2010-08-21. ↑ "The Rise of the Pasdaran: Assessing the Domestic Roles of Iran's Islamic Revolutionary Guards Corps" (PDF). Retrieved 2010-08-21. ↑ "No. 3646 | National | Page 3". Irandaily. 2008-11-13. Retrieved 2010-08-21. ↑ "Iranian economists lash out at Ahmadinejad's policies." Archived 2008-12-07 at the Wayback Machine Daily Star. Retrieved 26-01-2008. ↑ "Geopolitics casts pall on hobbled Iranian economy." USA Today. Retrieved 26-01-2008. ↑ Gulf News Archived 2007-09-29 at the Wayback Machine , 2007-07-12. ↑ "Q&A: Petrol rationing in Iran". BBC News. 2007-06-27. Retrieved 2007-07-02. ↑ "Iran bans negative petrol stories". BBC News. 2007-06-28. Retrieved 2007-07-02. ↑ Tait, Robert (October 23, 2006). "Ahmadinejad urges Iranian baby boom to challenge west". Guardian Unlimited. London: The Guardian. Retrieved 2007-05-03. ↑ Iranian Parliament Delays Vote on Bill That Upset Judiciary, Women's Activists, Thomas Erdbrink, Washington Post , September 3, 2008. Retrieved September 21, 2008. ↑ A Victory for Rich Iranian Bigamists, Meir Javedanfar, Pajamas Media , September 3, 2008. Retrieved September 21, 2008. ↑ Kull, Steven (23 November 2009). "Is Iran pre-revolutionary?". WorldPublicOpinion.org. opendemocracy.net. Retrieved 2010-02-16. ↑ "Iran - Conservatives return to power". Encyclopedia Britannica. Retrieved 2019-01-16.